We believe that children learn best through hands-on exploration and play. Therefore, we utilize a child-centered approach to education. Teachers plan lessons with the whole child in mind. Specifically, lessons are constructed to promote growth in the following key areas; social foundations, physical well-being and motor development, language and literacy, mathematics, science, social studies, and the arts. We allow children to make choices from a variety of interesting activities and outside exploration. As a Christian school, we honor faith development with a prayer of thanksgiving before snack and lunch, and we are reminded of God's love for us through bible stories at chapel time. Jesus' birthday is celebrated with songs during our lively Christmas program. We also practice service and outreach by collecting canned goods for a local food pantry and caps & mittens for a shelter for women & children. Our classes for 2½ year olds and 3 year olds are designed to foster social and emotional growth. Children are encouraged to take turns, share with their friends, listen to a short story in circle time, learn words to communicate their feelings, make independent choices, and become confident in the culture of school. Science, technology, engineering, art, and math (STEAM) activities are implemented in all of our classes. Circle/Meeting Time--stories, rhymes, fingerplays, sharing, and music. Learning Centers--dramatic play area, blocks, floor puzzles and table-top puzzles, play-dough, easel painting, art projects, library, hands-on manipulatives such as magnets, magnifying glasses, shape and counting/sorting activities, cooking, and other hands-on activities that reinforce the learning objectives. Chapel--takes place in First Lutheran Church's sanctuary, once a week on Wednesdays and the 1st Thursday of every month. Snack--fresh fruit and crackers or pretzels to eat, and water to drink. Recess--indoor space s available for large motor activities when the weather does not permit us to go outside on our playground. 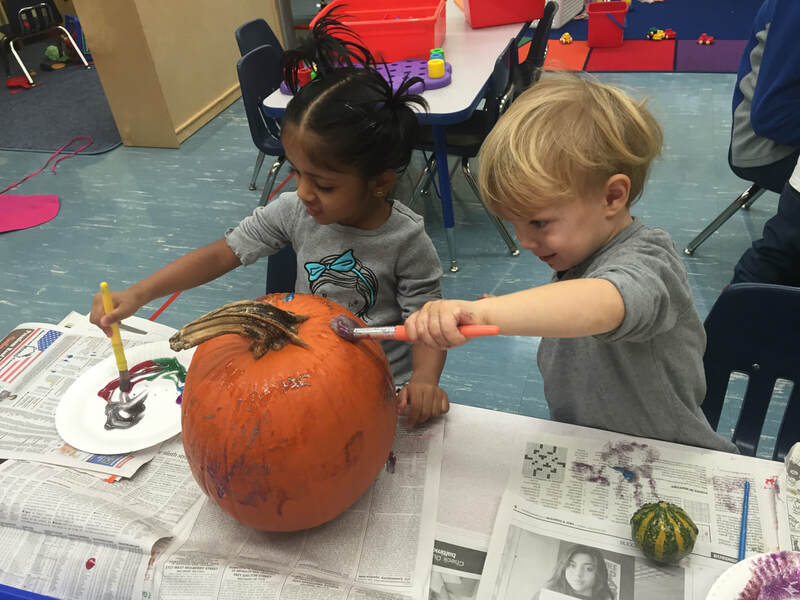 Prekindergarten classes (ages 4+) use project-based learning, where children are encouraged to form questions and do research using hands-on exploration to learn about a topic. Building on natural curiosity, children are encouraged to interact, question, connect, problem-solve, communicate, reflect, and more. Children are also introduced to Handwriting Without Tears, a fun way to learn how to write letters and numbers. Meeting Time-- Teacher led discussion to help children form questions about a topic. Project Activity-- Experimentation and learning through play--may take place outside or inside. Project Recording-- Using art, language, and technology, children record and express what they have learned through observation and experimentation. Project Sharing-- Children share what they have learned and created with their families. Lunch Bunch is 11:45 a.m.-12:30 p.m. and open to all 3-5 year olds. Children bring their lunch from home and eat together with their school friends. We serve 1% milk and water. Parents should not pack food containing peanuts or tree nuts, including peanut butter. 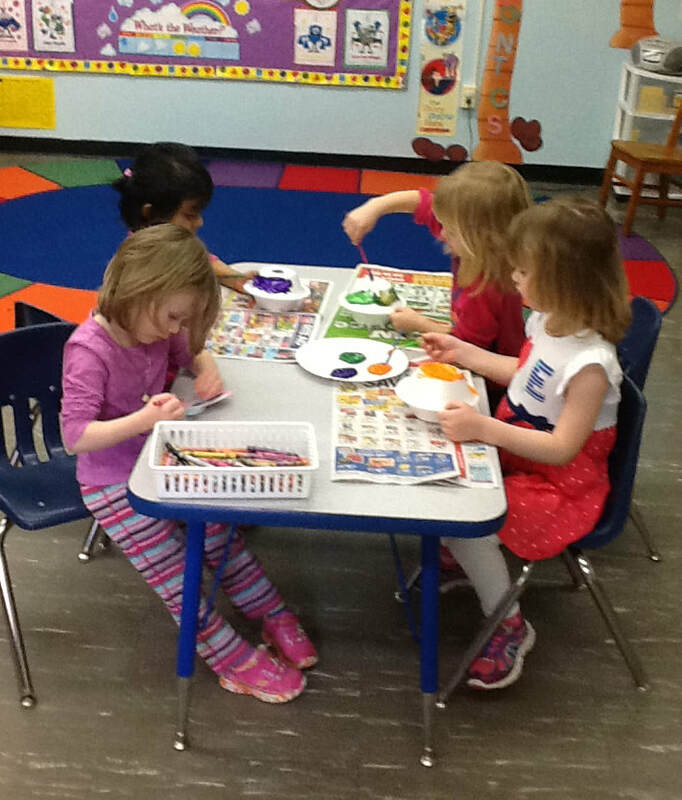 Fun Days is our after school enrichment program for 3-5 year olds. Children stay for Lunch Bunch, then meet from 12:30 p.m.-3:00 p.m. for additional outside play (weather permitting) and exploration (indoors and outdoors) of fun themes. Themes in past years have included safari adventures, circus, travel around the world, making teddy bears, and more! Fees can be found on our tuition page. 5. Remove from heat and knead vigorously until no longer sticky. 7. Pack in air-tight container & ENJOY!